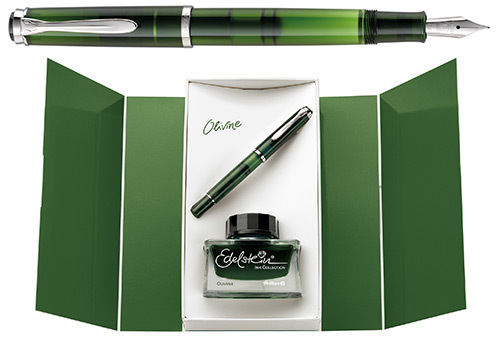 Already keenly awaited since the launch of the Edelstein Ink of the Year 2018: the color matching series Classic 205 Olivine. The shade of color is extraordinary: the naming Olivine leads to an imagination of a pure olivine-green color version. Actually, the color impression of the natural gem stone combines a lighter green, develops to a darker tree-green and finally shows effects of more olive- green shades. The different strengths of material dimension in the various product components follow up this effect and lead to a variation of green- color shades in just one pen. Amazing. The series Classic 205 Olivine will be offered as a fountain pen with differential piston mechanism and a ball pen with the well-established push- mechanism. The stainless-steel nib of the fountain pen M205 is high- polished and shines in sparkling silver. Depending on individual handwriting and preferences, it is eligible in nib width EF, F, M and B. The set of M205 fountain pen together with the Edelstein Ink bottle creates for all color concept enthusiasts a Must-Have.